Hi-Tech is not only known for developing single component of a modern Powertrain like engine, energy stores, control, electrical motor but also for optimizing them simultaneously. Hi-Tech survives in a competent market and develops complete comprehensive systems that integrate different customers’ needs into one. 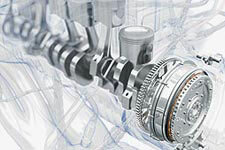 Hi-Tech is a name synonymous with integrated Powertrain Solutions for Sustainable Mobility.